« Where’d the tower go? East Dedham Firehouse Tower…Gone With the Wind! It was Hurricane Carol that took out the 80-foot bell tower, in dramatic and dangerous fashion on August 31, 1954. Lifted by a particularly strong gust, the tower tore loose from the building and sailed across the fire station, crashing into the house next door, where Mrs. Louise Guerrio was feeding her one year old son Joseph at the time. Miraculously, neither Mrs. Guerrio nor her son were hurt. A portion of the tower fell across Bussey St., crushing 3 cars and damaging the house at #219. The steeple of the Old North Church and a WBZ radio tower were also toppled by the hurricane, which was more powerful and more devastating than the famous 1938 storm. Thanks to Firefighter Charlie Boncek for letting me use these images. This entry was posted on May 5, 2011 at 8:53 pm and is filed under Dedham Then and Now, History/Mystery, Lost Dedham. You can subscribe via RSS 2.0 feed to this post's comments. You can comment below, or link to this permanent URL from your own site. 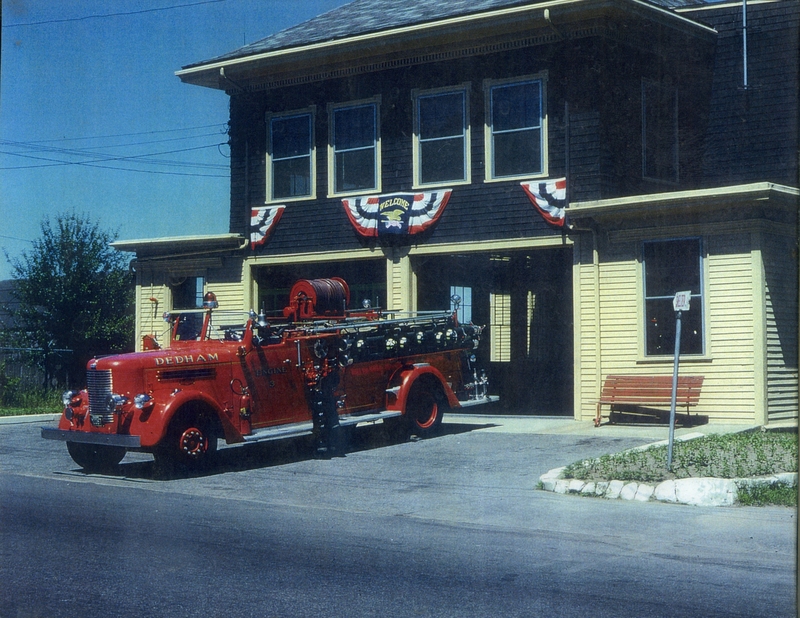 I was hoping you’d post an early photo of the fire station…great pic! Any idea of the year it was taken? 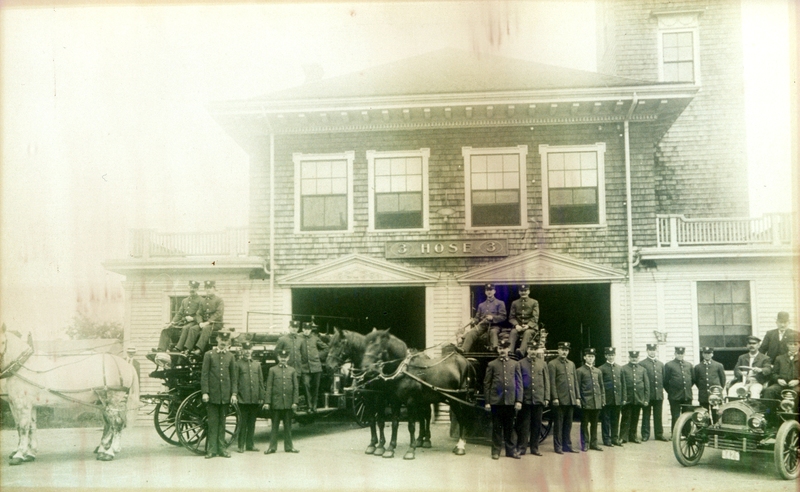 According to the Historical Society, the fire department did not wear uniforms until 1906, so I would say this picture was taken around that year. The Globe article about the tower crash states that the building was put up in 1889, but the correct date is 1897.
judging by the picture i sent you jim,1897 would be the wrong date also.The picture i sent had to be taken in the 50s or 60s.